i hate that saying; it makes absolutely no sense to me. who has ever had some cake and not eaten it? certainly not my soon to be wife. she loves cake. she even eats cake that other people have. and though i hate the saying, i suppose i understand what it actually means: while you can want everything, you shouldn’t expect to get it all. why do people use this silly saying when they can just say what they actually mean?! madrid's champions league failure is likely a bad omen for current manager manuel pellegrini. but to use the stupid anaology anyway, as a real madrid fan i’m constantly used to having my cake and eating it too. in fact, madrid is just like my fiancée… they eat everyone’s cake. the cake being superstars, of course. the only cake the merengues haven’t been eating as of late (and by “as of late” i mean “the last six years”) is the champions league flavored kind. i touched on why we’re not getting our dessert in a post from last week. and like any spoiled brat who doesn’t get their cake, real’s fans and management are likely pitching a fit about it in the privacy of their homes, boardrooms and newspapers. and though i consider myself a madrid fan, i’m trying my best to quell the feeling in the pit of my stomach that is telling me to panic. like i said in my earlier post, i think that madrid’s new galácticos need to build on the success they’ve had so far and carry that into next season. i never expected them to pull the rabit out of the hat and win the champions league this year: teams just don’t gel that fast. i also emphatically requested that real’s head honchos hang on to manuel pelligrini for next season, too. i think the chilean manager is a very qualified coach, and that his team strategy and tactics need time to sink in and become habit for the playing staff. my belief is that he can push this team to greatness in the coming seasons, if given the opportunity to remain at the helm. but the “shock” defeat by lyon in the champions league, eliminating the chance for los blancos to win europe’s most coveted prize in their home stadium this season, is probably the last nail in the coffin for real’s management. i would be shocked if he wasn’t sacked after the season, even if they can wrestle the la liga title away from barcelona this season. the directors and board are just not getting to eat the cake they want so bad. so with pelligrini seemingly heading out the door, that means the vacant hot seat will need to be filled quickly. but the question remains, who is going to fill it? just as real madrid like to fill their match day squad sheet with big-time names, they also like to have a big time name picking the names on the sheet. and while it’s never beyond real to throw piles of money at club to get the big name they want (ahem… villareal for pelligrini), they might not have to do that this time around. two of the biggest names in the world of football managers appear to have one foot out the door at their current clubs. and while i would definitely want one of them to take over the reigns at madrid, what will likely happen is the other result which i really really don’t want. i can answer this with three short words: the special one. if pelligrini does fall victim to real’s oft-used managerial axe, the manager i want more than any other is the enigmatic josé mourinho. and the former chelsea and current inter milan manager looks like he is lining up an exit from the san siro this summer, perfect timing for real to swoop in. the special one seems like the best choice for the job. i doubt real's fans and management would agree with me though. the indicator of mourinho’s exit from inter is imminent comes from the portuguese manager himself, stating multiple times that he desires to coach in spain and england again at some point in his career. and sooner rather than later. the special one has also said he doesn’t really fancy the italian game. i don’t blame him: those guido’s spend at least half as much time on the ground as drogba does… so about half a typical game. even inter seem to be pushing him out the door, as reports indicate they’ll axe him themselves if he can’t produce the champions league trophy they brought him in for. so why do i want mourinho in the spanish capital so bad? the first reason: track record. in addition to his winning pedigree, the other aspect that mourinho brings to the table to make him so appealing to me is his ability to effectively handle big name players. chelsea dumped millions into big name after big name, but the special one was still able to mold them into a successful and competitive side. madrid obviously have this problem, and it’s one i feel he is more adept to handle than any other manager out there (aside from perhaps sir alex and vicente del bosque). while tottenham gaffer ‘arry redknapp agrees with me that real will be mourinho’s next stop, there’s a good chance i may find myself in the minority as far as real supporters are concerned. the madrista management and fans desire free-flowing, artistic, attacking football. this desire is so strong that it can even be partially blamed for capello being fired twice at real, despite providing league trophies both seasons he was there. attacking oriented football is not something that josé brings to the table. instead, mourinho is like a grand master in chess: tactics and sound defense are his primary weapons, and he’s damn good with them. his teams, primarily during his time at chelsea, were labeled as efficiently dull. through mourinho’s scientific approach to the game, they grind out results instead of piling on goals. this is one of the reasons why i fear he won’t be picked as pelligrini’s potential successor. the fans and president will reject him on principal alone. that and the fact that mourinho seems to have wet dreams about england on a regular basis. i honeslty think that if mourinho does leave inter this summer, he’ll most likely land at liverpool when they inevitably let the fat spanish waiter go this summer. my only possible saving grace is that i firmly believe that the special one has his heart set on returning to england for one job, and one job alone: manchester united. when (and if) sir alex ever retires, mourinho seems like the only logical choice to replace old red nose. and i’m sure that mourinho is fully aware of that. ultimately, i don’t think mourinho is going to land in madrid, despite the fact that he’s the one person who can right their ship. and unfortunately, that leaves only one “logical” option for madrid. 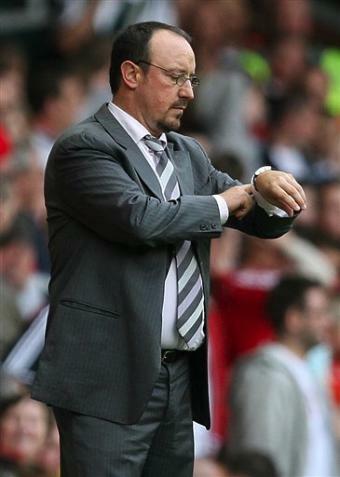 the fat spanish waiter himself, rafa benítez. the fat spanish waiter knows his time is almost up at liverpool, and he'll have options once he leaves. rafa has been teetering on the edge of being sacked just about all season, after his side has drastically underperformed for a majority of the campaign. as i’ve said multiple times, even if the reds somehow stumble into a champions league spot (please no, please no, please no… come on you spurs! ), i think benítez will still be on his way out. the only thing keeping the scousers from giving him the boot so far has been rafa’s move to sign a five year contract extension before the start of this season. the buyout of the rest of his contract would cost the cash-strapped club a whopping amount of money, something their american owners would probably both agree not to part with. so you’re probably wondering why i don’t want benítez at real at this point, and the answers i’m going to give you are the same reasons why he has failed so miserably this year at anfield. up until this season, rafa had always claimed that the reason why liverpool couldn’t quite get over the hump was because he didn’t have complete control of the club’s transfer decisions. he argued that to win the premier title that their club so strongly desires, he would need to have all of the power he currently shared with chief executive rick parry, and that he wouldn’t sign a new contract unless his demands were met. the board eventually caved to rafa’s desires, and parry chose to exit the club before this season started. throw in that he also wanted full control of the youth and reserve teams at liverpool (leading to the departure of their highly successful youth team manager) and this was the beginning of the end for liverpool. having engineered his devilish plans to take complete control of the liverpool footballing reigns, rafa signed his new, long-term deal to ensure his future regardless of performance. this contract might have been the only smart move he made in this entire process. liverpool have certainly paid for making such an ignorant decision, as benítez’s transfer dealings have been pretty much misses instead of hits. he’s got no one to blame for these gaffs either; they’re all on him this time around. the engine of last season alonso was sold off, and an injured aquallani brought in despite the fact that they knew he wouldn’t play for nearly half the season. a refusal to sign another quality forward to take the pressure off of torres. selling off your only quality wing back (arbeloa), and only bringing in one quality replacement (johnson) when you actually needed two. at madrid, he won’t be given this complete control –thank god– and this is something he’ll likely want. nothing like adding a little more drama into the mix, right? additionally, benítez is notorious for being disliked by his players. they describe him as callous, uninvolved, and uncaring. there have been numerous reports on how he’s divided the locker room at anfield this season in particular. he drove alonso away by trying to use him as a pawn in trying to land gareth barry. we’ve all seen how well he get’s along with riera. but the most poignant example of rafa’s inability to relate to players comes from one of their best players. in his recent autobiography, fernando torres stated that after his child was born, benítez approached him at the training ground and congratulated him. torres went on to thank him and went on to say how excited he was to be a father. the fat spanish waiter stared back at torres with his head cocked like a confused dog, before explaining that he was congratulating him on the nice game he had the previous weekend. he had no clue that his star striker had just become a dad. clueless. yet despite all of rafa’s short-falls, he’ll still likely end up in madrid hot seat. because if there’s one thing madrid love as much as signing superstars, it’s signing spanish superstars. though just like with mourinho, there’s a saving grace for me on this front too. while madrid themselves have been mum when it comes to expressing interest in the fat spanish waiter, juventus certainly haven’t held their tongue. and regardless of who eventually lands benítez, liverpool will gladly let him go to them, as they will hit a lottery of sorts because whatever club that is will have to buy him out of his contract. it’s like someone will pay them for their problems… win-win for the kop, right? well, rafa’s potential arrival is potentially a no win for real madrid. his inability to navigate the transfer market should be the largest red flag, though a boundless budget (something that is quite foreign to anyone at liverpool’s helm) at madrid may help to alleviate his shortcomings. but even more worrisome, to me at least. is the fact that rafa can’t people manage well enough at “big time” liverpool. at madrid, he’ll have infinitely larger egos and more of them to boot. so the question remains: what cake will i be eating come this summer? one would think that i would be happy with all of the cake madrid have fed me over the last 12 months. i mean, apparently i’m not happy with a cake topped with ronaldo, kaká and alonso, right? but honestly, i’d prefer to keep eating that same cake (let’s hang on to pelligrini). but if i had to choose, i would want a portuguese flavored treat. what will happen is probably a completely different story. if only things were so simple in madrid. Next Post: wanna watch rolfe play live?